Normal enzyme function of N-acetylglutamate synthetase (NAGS) deficiency is confined to the hepatic mitochondria and mediates the reaction acetyl-coenzyme A (CoA) + glutamate → N-acetylglutamate + CoA. As a mitochondrial reaction, each of the substrates is normally omnipresent. Acetyl-CoA is a cofactor in many mitochondrial reactions, and glutamate is the transamination product of α-ketoglutarate and alanine; α-ketoglutarate is produced by the Krebs cycle. The normal function of N-acetylglutamate (NAG), the reaction product, is to act as an activator of carbamyl phosphate synthetase (CPS), which is also a mitochondrial enzyme. See the image below. The activation process requires physical binding of NAG to the CPS enzyme, in turn, causing the inactive form of CPS to convert to an active state. Thus, CPS activity is regulated by the relationship of available NAG to inactive CPS enzyme protein. Clinical signs and symptoms of NAGS deficiency occur when ammonia fails to fix into carbamoyl phosphate (CP) effectively, thus disabling the urea cycle. This leads to accumulation of alanine and glutamine (transamination products of pyruvate and glutamate, respectively) and, finally, of ammonia. The condition is progressive without intervention. Overall, the hepatic urea cycle is the major route for waste nitrogen disposal, generation of which is chiefly from protein and amino acid metabolism. Low-level synthesis of certain cycle intermediates in extrahepatic tissues makes a small contribution to waste nitrogen disposal as well. A portion of the cycle is mitochondrial in nature; mitochondrial dysfunction may impair urea production and result in hyperammonemia. Overall, activity of the cycle is regulated by the rate of synthesis of NAG, the enzyme activator that initiates incorporation of ammonia into the cycle. Too few cases have been reported to cite any incidence figures. However, recognition of affected patients is increasing. Because the clinical presentation is indistinguishable from that of CPS deficiency and because the diagnosis is difficult, the true incidence may be underestimated. This is further emphasized by the fact that genetically affected individuals may remain asymptomatic for many years. 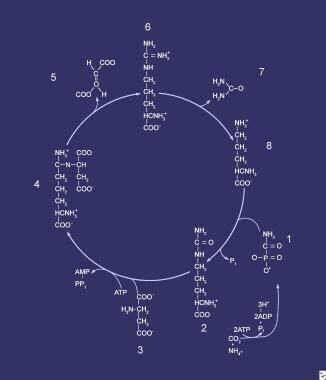 A newly formed Urea Cycle Disorders Consortium in the United States reported on a cross-section of patients throughout the country; remarkably, not a single case of NAGS deficiency was identified. However, because NAG is the requisite activator for CPS, occasional mistaken diagnoses of CPS deficiency may have obscured cases of NAGS deficiency. Only a handful of cases have been reported worldwide. NAGS deficiency is associated with significant morbidity and mortality. Patients who present with hyperammonemia are at risk for cerebral edema and death if treatment is not immediately begun. Survivors of hyperammonemic coma are likely to suffer brain damage and resulting developmental delays, learning disabilities, and/or mental retardation. Case reports of NAGS deficiency have shown the condition to occur in both sexes; because the mutation is inherited as an autosomal recessive trait, this is to be expected. NAGS deficiency can present at any age. As with many inherited metabolic diseases, the most likely time of presentation is in the newborn period. Long-term prognosis is unclear; most likely, the future intelligence quotient score depends on the severity of the initial presentation and the subsequent hyperammonemic episodes suffered. Inform parents of their obligate heterozygote status given the likelihood that this is an autosomal recessive trait. Parents must understand that the chance of recurrence is 1:4 (25%) with each subsequent pregnancy. Advise parents to seek early medical attention for the patient in the event of intercurrent illness. Diez-Fernandez C, Häberle J. Targeting CPS1 in the treatment of Carbamoyl phosphate synthetase 1 (CPS1) deficiency, a urea cycle disorder. Expert Opin Ther Targets. 2017 Apr. 21 (4):391-399. [Medline]. Al Kaabi EH, El-Hattab AW. N-acetylglutamate synthase deficiency: Novel mutation associated with neonatal presentation and literature review of molecular and phenotypic spectra. Mol Genet Metab Rep. 2016 Sep. 8:94-8. [Medline]. [Full Text]. Tuchman M, Lee B, Lichter-Konecki U, et al. Cross-sectional multicenter study of patients with urea cycle disorders in the United States. Mol Genet Metab. 2008 Aug. 94(4):397-402. [Medline]. [Full Text]. Cartagena A, Prasad AN, Rupar CA, Strong M, Tuchman M, Ah Mew N, et al. Recurrent encephalopathy: NAGS (N-acetylglutamate synthase) deficiency in adults. Can J Neurol Sci. 2013 Jan. 40(1):3-9. [Medline]. [Full Text]. Caldovic L, Morizono H, Tuchman M. Mutations and polymorphisms in the human N-acetylglutamate synthase (NAGS) gene. Hum Mutat. 2007 Aug. 28(8):754-9. [Medline]. Liu J, Lkhagva E, Chung HJ, Kim HJ, Hong ST. The Pharmabiotic Approach to Treat Hyperammonemia. Nutrients. 2018 Jan 28. 10 (2):[Medline]. [Full Text]. Gessler P, Buchal P, Schwenk HU, Wermuth B. Favourable long-term outcome after immediate treatment of neonatal hyperammonemia due to N-acetylglutamate synthase deficiency. Eur J Pediatr. 2010 Feb. 169(2):197-9. [Medline]. Tuchman M, Caldovic L, Daikhin Y, et al. N-carbamylglutamate markedly enhances ureagenesis in N-acetylglutamate deficiency and propionic acidemia as measured by isotopic incorporation and blood biomarkers. Pediatr Res. 2008 Aug. 64(2):213-7. [Medline]. [Full Text]. Bachmann C, Colombo JP, Jaggi K. N-acetylglutamate synthetase (NAGS) deficiency: diagnosis, clinical observations and treatment. Adv Exp Med Biol. 1982. 153:39-45. [Medline]. Caldovic L, Ah Mew N, Shi D, et al. N-acetyglutamate synthase: structure, function and defects. Mol Genet Metab. Feb/2010. 100(Supplement 1):S13-S19. Caldovic L, Morizono H, Panglao MG, et al. Late onset N-acetylglutamate synthase deficiency caused by hypomorphic alleles. Hum Mutat. 2005 Mar. 25(3):293-8. [Medline]. Caldovic L, Morizono H, Panglao MG, et al. Null mutations in the N-acetylglutamate synthase gene associated with acute neonatal disease and hyperammonemia. Hum Genet. 2003 Apr. 112(4):364-8. [Medline]. Elpeleg O, Shaag A, Ben-Shalom E, Schmid T, Bachmann C. N-acetylglutamate synthase deficiency and the treatment of hyperammonemic encephalopathy. Ann Neurol. 2002 Dec. 52(6):845-9. [Medline]. Elpeleg ON, Colombo JP, Amir N, et al. Late-onset form of partial N-acetylglutamate synthetase deficiency. Eur J Pediatr. 1990 Jun. 149(9):634-6. [Medline]. Guffon N, Schiff M, Cheillan D, et al. Neonatal hyperammonemia: the N-carbamoyl-L-glutamic acid test. J Pediatr. 2005 Aug. 147(2):260-2. [Medline]. Guffon N, Vianey-Saban C, Bourgeois J, et al. A new neonatal case of N-acetylglutamate synthase deficiency treated by carbamylglutamate. J Inherit Metab Dis. 1995. 18(1):61-5. [Medline]. Haberle J, Koch HG. Genetic approach to prenatal diagnosis in urea cycle defects. Prenat Diagn. 2004 May. 24(5):378-83. [Medline]. Plecko B, Erwa W, Wermuth B. Partial N-acetylglutamate synthetase deficiency in a 13-year-old girl: diagnosis and response to treatment with N-carbamylglutamate. Eur J Pediatr. 1998 Dec. 157(12):996-8. [Medline]. [No authors listed]. Carglumic acid: new preparation. An advance in rare urea cycle disorders. Prescrire Int. 2004 Feb. 13(69):3-4. [Medline].